Faye Longchamp and Joe Wolf Mantooth have traveled to Neshoba County, Mississippi, to help excavate a site near Nanih Waiya, the sacred mound where tradition says the Choctaw nation was born.When farmer Carroll Calhoun refuses the archaeologists’ request to investigate an ancient Native American mound, Faye and her colleagues are disappointed. But his next action breaks their hearts: he tries to bulldoze the huge relic to the ground. Faye and Joe rush to protect history, with their bodies if necessary. The situation grows more dangerous as Choctaws arrive to defend the mound and the farmer’s white and black neighbors come to defend his property rights. A popular young sheriff is able to defuse the situation, but tempers are short. That night, Calhoun is found dead, his throat sliced with a handmade stone blade. Was he killed by an archaeologist angered by his wanton destruction of history? Did a Choctaw take up arms to defend an embattled heritage? Did someone decide to even the score with an old rival?The sheriff is well-aware that Faye and Joe were near the spot where Calhoun’s body was found. The whole county saw their confrontation with him over the mound. And their combined knowledge of stone tools is impressive. They had motive, means, and opportunity—but so did almost everyone in Neshoba County. Mary Anna Evans has done it again! She creates a vivid archeological dig, that is both realistic in theme and nature. The characters are 3-dimensional with outside interests other than the plot, there are misleading clues as well as hidden agendas. I so wish many writers would take the time to craft such a well-written, thought-out plot. Place is important and can be a character in and of itself. In Effigies, place is very important but doesn’t overshadow the characters, rather, becomes impetus for their actions (or lack thereof). Why is the mound so important to so many? What happened out in the field? Why is the river so important? As the readers delve further into the book, more and more history of the region that Mary creates or brings forth, becomes crystal clear. Nothing written is ever wasted. Mary also continues the friendship/close relationship between Faye and Joe. It’s complicated, deep and moving. Are they a couple, unbeknownst to Faye? Does she realize she loves Joe? Mary shows how confused Joe is, about his heritage and wanting to fit in with other people. Conflicted emotions are shown and well thought out. 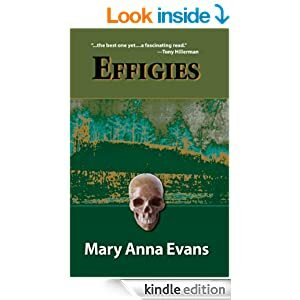 I loved Effigies and give a hearty 5-stars. ← All my books are free during Read an EBook Week!